A tasty salad dressing can really be a positive addition to a salad. While adding flavor, the oil can help make nutrients in the salad, particularly the fat-soluble vitamins and phytochemicals, more accessible to your body. 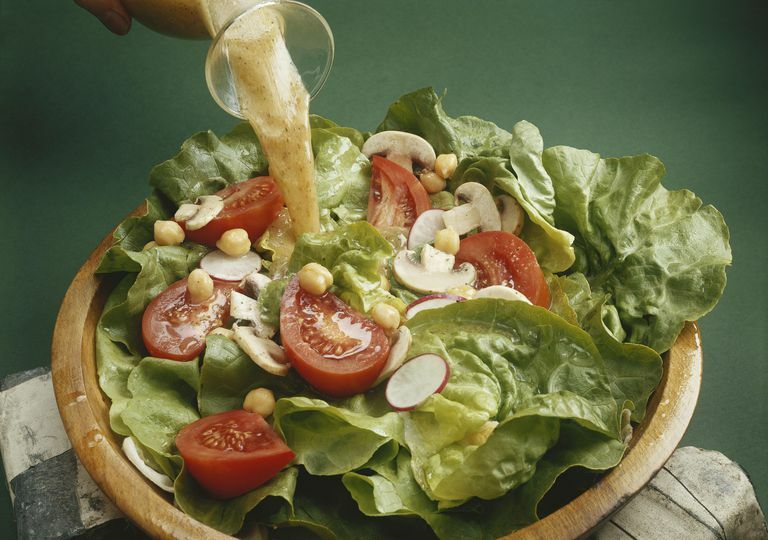 There are a few pitfalls to be aware of when you’re shopping for high-quality salad dressings. The four factors to consider are: serving size, added sugars, the quality of the oils used, and any extra ingredients. Salad dressing is a prime example of “rounding error” when it comes to serving size. It’s very easy to use a lot more than you realize, and whether you’re tracking calories, fat, or carbohydrates, unless you’re measuring carefully and noting serving size, you’re likely to get an inaccurate sense of how much you’re consuming. For example: One serving of Newman’s Own Balsamic Vinaigrette dressing (two tablespoons or 30g) has 3g of carbohydrate. If you’re drenching your greens straight from the bottle without using a spoon to measure, your effort to choose a dressing that won’t add carbs to your daily intake will be thwarted. If you're also watching calories, they add up fast once you start doubling—or tripling—serving sizes. Newman’s Own Balsamic Vinaigrette has 90 calories per serving, so if you carelessly pour it on you could easily add 100-200 calories to your salad without realizing it. One tip for keeping serving sizes in check is to change how you dress your salad. It only takes a small amount of an oil-based dressing to coat your greens: the trick is to put a small amount of oil in a large bowl, add your salad mix, and toss well. This strategy not only uses less oil, but tastes better because the salad has an even coating of dressing. When poured on top, you’re left with parts that are bone dry and others that are soggy. While many salad dressings may be considered more savory in taste, they can have a lot of added sugar. When you’re checking the nutrition label, be sure to look under "Total Carbohydrate,” as well as the ingredient list, to check for hidden sugars. Sugar's presence on a food label isn't always obvious. Look for ingredients with "syrup" or "juice" in the name or the suffix "-saccharide" or "-ose." Keep in mind that many sugar-free products have ingredients meant to replace sugar. Some of the most common are xylitol, sorbitol, and aspartame. Another tip to keep in mind is that reduced-fat dressings usually have more sugar than "regular" varieties. Girard's Caesar Dressing has 1 gram of carbohydrate per serving (two tablespoons). The brand’s "light" (reduced-fat) Caesar dressing has 5 grams of carbohydrate per serving. The fat-free version has 9 grams of carbohydrate per serving—that’s more than a teaspoon of sugar for each tablespoon of dressing. Kraft Buttermilk Ranch Dressing has 2 grams of carbohydrate per serving, while the fat-free version contains 11 grams. Brianna's Blush Wine Vinaigrette has 14 grams of carbohydrate for a two tablespoon serving. Many balsamic vinegars contain sugar, though there are options with less. Look for dressings with 1 gram of carbohydrate or less per two-tablespoon serving. Avoid those with sugar—especially as one of the first four entries on the ingredients list. The best oils for salads dressings are those high in monounsaturated fats and low in omega-6 fats (which are not bad in and of themselves, but most people get more than they need in their diet). If you’re looking for a widely available and reasonably-priced option, olive oil will be your best bet. With 73 percent monounsaturated fat and 9 percent omega-6, olive oil also has many other nutritional benefits. Another popular option is canola oil, which has 59 percent monounsaturated fat and 20 percent omega-6. Oil made from soybeans is one of the most commonly-used oils and also tends to be the least expensive—but with 23 percent monounsaturated fat and 51 percent omega-6, a little goes a long way with this option. Products may have "olive oil and vinegar" in the name, but be sure to take a closer look at the label. In many of these dressings, the second ingredient on the list (after olive oil) is actually soy and/or canola oil (Newman's Own Olive Oil and Vinegar is one example). You'll also want to check the label for partially hydrogenated fat or trans fat. While many manufacturers have dropped this ingredient from their salad dressing recipes, it still appears in some popular brands, such as Wishbone Chunky Blue Cheese Dressing. In the same way that sugar can hide in products under different names, there are other added or extra ingredients you'll want to keep an eye out for if you're on a low-carb diet. You probably already know to keep an eye out for the usual suspects when it comes to carbohydrates, but don't forget about starches. When it comes to salad dressings, starches can creep into ingredient lists not so much for taste, but texture. These ingredients are often added to change the consistency of a dressing or make it more shelf-stable. Check the ingredients list for flours, gums, or fibers like inulin. You may be daunted by the idea of making your own salad dressing, but with the right ingredients, it’s actually quite easy and affordable. If you have the following items in your pantry, you’ve got everything you need to make a tasty, healthy, dressing suitable for a low-carb diet. If you find your dressing is separating, use mustard to help hold it together. If your dressing is too thick, a little lemon juice is the secret to thinning it. The ratio should be 3 tablespoons of oil to 1 tablespoon of vinegar. Grab a bowl and mix in any desired seasoning to taste. You can make a fresh batch for every meal or use a mason jar or decanter to store any extra. A two tablespoon serving of your homemade dressing will have about 170 calories and just 2 grams of carbohydrates. Dressing made fresh rather than processed and bottled also has less sodium, no additives, and you have complete control over what is (or isn't) in the recipe. Grams of carbohydrate per serving. White WS, Zhou Y, Crane A, Dixon P, Quadt F, Flendrig LM. Modeling the dose effects of soybean oil in salad dressing on carotenoid and fat-soluble vitamin bioavailability in salad vegetables. The American Journal of Clinical Nutrition. 2017;106(4):1041-1051. doi:10.3945/ajcn.117.153635.